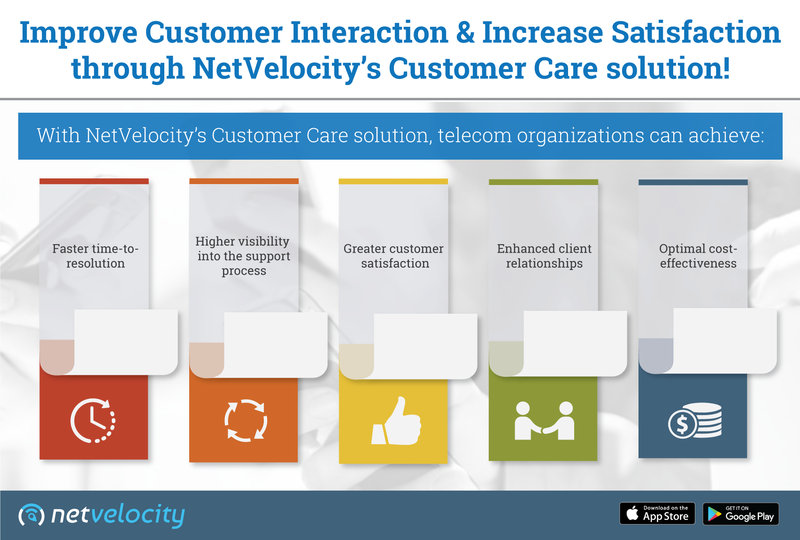 Enhance Customer Interaction with NetVelocity’s Customer Care solution! Home/Customer Service/Improve Customer Interaction & Increase Satisfaction through NetVelocity’s Customer Care solution! Technology and Telecom companies need to constantly innovate to stay ahead in business. Customer demands are ever changing in this dynamic industry. At this moment, the basic aim of telecom organizations is to meet the expectations and needs of their customers. Typical call centres are still unable to offer satisfactory support to their customers – but why? Most of the call centres are still stuck with the conventional ways of customer care. They are not keeping in tune with the needs of modern customers. The demands and expectations of modern customers are different from the conventional customer service norms. This is the precious time for telecom operators to look for the best solution that helps them to solve their customer issues and provide exceptional customer services. NetVelocity provides a comprehensive solution that assists telecom companies to provide personalized services and relevant solutions for the customer’s network problems. A good customer service experience is always remembered by the customers and they keep coming back. According to research, it is 6-7 times more expensive to acquire a new customer than retaining an existing one. With NetVelocity, operators can easily solve the problems of their customers, and as a result, gain long-term loyalty from your customers. Great customer service wins your business loyal customers for life. It has a direct and profound effect on your current client base and lifetime value of customers. A consistent level of quality to customers is important to create & sustain longevity in an extremely competitive corporate environment. Last but not the least, quality customer service results in increased profitability for your business. Word of mouth marketing expands client base and increased popularity. Understating the expectations and mindset of consumers using NetVelocity leads to more sales and higher profits.